In it's first month being carried by the Defense Commissary Agency (DeCA), J. Lee's Gourmet BBQ Sauce has eclipsed 2,000 bottles sold. What's impossible for man, is possible for God. J.Lee's Gourmet BBQ Sauce continues to do what the experts say can't be done. In the company's first month being carried by the U.S. Commissaries, J. Lee's has sold over 2,000 bottles. What makes this even more impressive is that the product is only currently carried in two regions; the South and the Central. Company C.E.O., Helen J. Lee, attributes this never before seen success to undying faith and work ethic. She can often be heard saying, "what's impossible for man, is possible for God". Commissaries have only been able to order J. Lee's since mid-August, and it was first seen on the shelves about one week later. TST (The Sauce Team) wasted no time in setting out to let everyone know about the sauce you can "put on anything". The Team began presenting its patented demonstrations, starting with Keesler Air Force Base, in the company's hometown of Biloxi, MS. Keesler is most familiar with J. Lee's so the customer's there might be considered an easy sell; but the commissary management team was shocked to see over 400 bottles cross the register in the first two weeks of carrying the product. TST did not stop there, hitting more bases in Mississippi and Florida, and continuing to put up record sales numbers. The next challenge for TST was to go to a market that had never had J. Lee's Gourmet BBQ Sauce. The first stop on that list was the state of Kentucky. The Sauce Team traveled to the Ft Campbell and Ft Knox commissaries and proved that J. Lee's is "A taste that all families love", as stated on the bottle. With no prior knowledge of the product, and just one taste, the military families of Kentucky purchased J. Lee's in record amounts. The highlight of the trip being Ft Knox selling 289 bottles in one day. The Sauce Team will be presenting J. Lee's Gourmet BBQ Sauce to the rest of DeCA's Southern and Central region commissaries over the next few months. The team's schedule can be followed on social media via facebook, twitter, and linkedin. 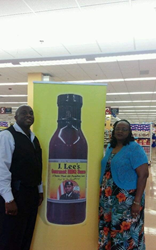 For those who can't wait to find out what all the excitement is about, bottles can also be purchased online at http://www.jleessauce.com.